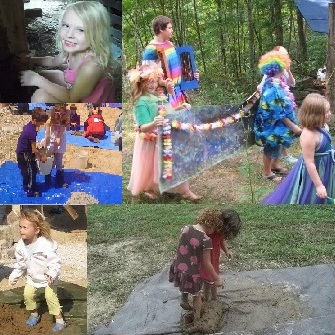 Kid’s Cob Camp at Disputanta Cob is an opportunity for younger children to have hands on experience with cob building that is tailored to your child’s individual needs along with other creative activities and play that honors the natural world. Each day will start with breakfast with, “Kids Cob Camp,” participants (the kids) and, “From the Ground Up with Cob,” participants (the parents) eating together. Kids Cob Camp will open with parents checking in after breakfast by 7:50, followed by Community Circle for sharing at 8:00. Ideas and feelings expressed by the group will guide which way the day moves with a certain organic flow. Within that flow, your child will be provided opportunities to make a nature journal in which they can write or draw pictures that reflect their experience at Kids Cob Camp. We will take nature walks and make art with whatever the land provides and use upcycle materials to make percussion instruments for a rhythm circle. Children will be encouraged to create and tell stories, share music, poetry and dance. Our cob project will be building a very small cob garden wall to create a micro environment to extend the growing season here in Kentucky at the building school. The kids will learn about growing veggies as well, and they will create a small organic garden that will include bean seeds on the verge of germinating. They will see the tender sprouts emerge by the last day of the workshop! Please feel free to share with us your child’s (children’s) current interests, as well as any other information you may feel helpful to understanding your child, to create a great personal and community experience. No child is made to engage in any activity they find uncomfortable. All children are asked to consider the group if not participating in a certain activity, by finding their quiet space within the group area and not leaving. Please send an afternoon snack plus an extra snack for morning break that your child enjoys.. Please advise us of any special dietary needs, food allergies or restrictions. Parents are welcome to drop in at any time daily to witness their child’s experience. Families with children have first dibs on showers, so around 4:00 parents should begin returning to their children for their family shower time and other needs before dinner. Our Youth Director, Melissa Neal, has a broad range of experience working with children. She has a BS in Psychology with a minor in Child and Family Studies. Melissa also has a Master’s in Social Work and has been practicing as an LCSW for 19 years, the last 5 of which have been in a school based clinic. Melissa also has experience with nature based work with women which spans 12 years. She is on the Women Quest Council as well as the Advisory Council for the Family Resource Center at Berea Community School. You may contact Melissa by calling her cell phone at 606 975 5274.